Helping others succeed drives me on everyday. I am an encourager so tutoring is more to me than just a job. I am making a difference in other people's lives. Create some art! The SCRAP Bin is one of Carrollton’s gems which many people have yet to discover. When you walk in, you may be reminded of your great aunt who never throws anything away. No matter what you need for your creation, there’s a good chance you’ll find it here: buttons, sea shells, jars, paint, brushes, crayons, bottle caps, fabrics….. And the prices…$ 0.01/ per crayon, so you collect enough for a box, and you have spent only $0.24! A bag of acrylic paints for $1! Give your child a couple of dollars, and she can buy enough supplies to last until school resumes in August. Summer Camp, June 14 -17, 10:30 – 2:00. C D Wind Spinners, June 21, 11:30 – 12:30, $2. Create a Fairy Garden, June 28, $2. Create a Bird Feeder, July 16, 11:30 – 1:00, $5. Decorate Picture Frame, July 30, $2. Another fun activity they sponsor in the summer is Art in the Park. Clues to this weekly scavenger hunt are posted on Facebook. As the name implies, the winner gets the artwork hidden in one of the area parks. What a great way to sharpen those analytical skills this summer! Finding the store may seem like a scavenger hunt. It is located at 1111 Bankhead Hwy in the former Big Lots shopping center which is across from First Tuesday Mall. Their summer hours are Tuesday – Saturday, 10:30 – 2PM. They respond quickly to questions sent through Facebook. Did you find something you liked in this series? Post photos to my Facebook page here. Please suggest other activities in the comments below. 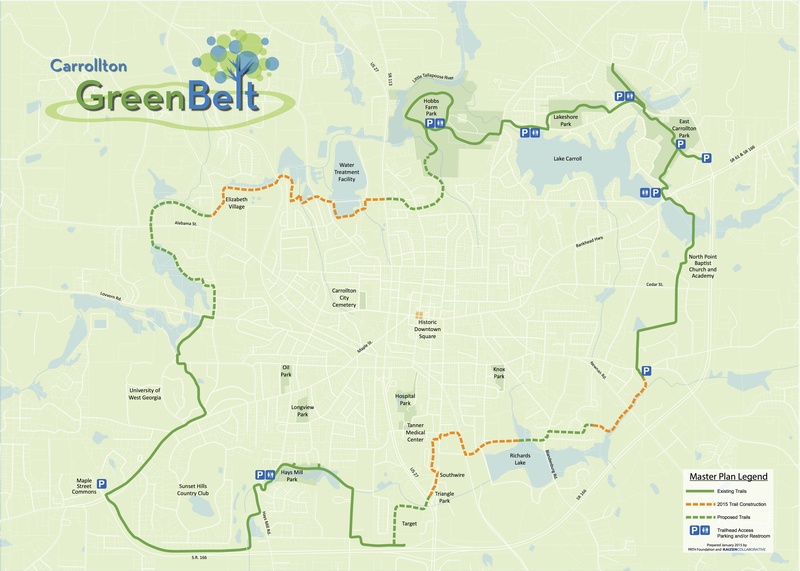 Explore the Greenbelt. You can stretch this into a summer adventure by taking one segment at a time. The loop contains sixteen miles of paved pathways around Carrollton which you can walk or bike. In fact, you can use any non-motorized mode of transportation. Use this map to choose a starting point. Your journey can become an opportunity to develop your child’s map reading skills. Be sure to make plenty of stops just to enjoy the scenic beauty, listen to birds, and watch wildlife. Near Hobb’s Farm, take a break at the wetlands area overlook. If you’re patient, you’re sure to spot something interesting. Several parks are located on or near the trail so pack a picnic lunch and save some bread for feeding the ducks on Lake Carroll. If you would like a longer, more strenuous course, try the Silver Comet Trail which extends from 285 to the Georgia/Alabama border. Please comment on any other trails you enjoy. Natural areas are always favorite places for children to explore. Fortunately, you don’t have to travel far or spend much money to take advantage of nature in west Georgia. Summer is an even better time to visit these places due to special interpretive programs offered. McIntosh Reserve Carroll County operates several parks which offer amenities such as camping, horseback trails, fishing, etc. A favorite destination is McIntosh Reserve which was once home to Creek Chief William McIntosh. It is located on the Chattahoochee River and has a reconstruction of McIntosh’s home. Each month the Friends of McIntosh Reserve sponsor a Walk and Talk program; the next Walk and Talk is Saturday, June 18. University of West Georgia biology professor Frank Fontanella will educate participants on reptiles and amphibians. The program begins at 9AM. For these activities, the normal $5 parking fee is waived, so this is a free event! Find out more about Carroll County Parks and their facilities and the Friends of McIntosh Reserve. Historic Banning Mills If you’re a West Georgia resident, you have probably heard of their zip line tours. However, did you realize that Banning Mills regularly host “Winged Ambassadors?” As the name suggests, their mission is to educate the public about the value of birds of prey. Everyone in the family will enjoy this show, and the cost is only $5/person. There are several opportunities available to see this program. Get all the dates here, but be sure to call 770-834-9149 for confirmation as dates are subject to change. Great memories are made at summer camp. Today’s post features one overnight and several day camps. Camp Grandview This is the Salvation Army’s camp for children located in Jasper, GA. They have three spaces available for June 20 – 25, for girls ages 7 – 12. Campers have a great time as evidenced by this video. The camp is free; transportation is provided by bus from Carrollton. If interested, you must act quickly. Parents or guardians will need to complete an application at the Carrollton Service Center, located at 115 Lake Carroll Blvd, provide a copy of the child’s vaccination record, and a physical report of good health (must have been performed within the past year) by Friday, June 10. For more information, call 770-830-0120 . For readers who live in other areas, contact your Salvation Army service center for camp information. Carrollton Cultural Arts Camps. These day camps meet Monday through Friday. They offer both visual and performance art camps so your child can develop her creative side. The art camps range from free to $50 and include supplies. The theater camps conclude with a live public performance on the following Saturday evening; admission fee is $2. Primary theater camp is open to children ages 4 – 7 and costs $45. The children’s theater camp is for ages 8 – 12 and costs $75. Go here to learn more. University of West Georgia Camps. Whatever your child’s age or interest, UWG continuing education has a camp for him! This is also a great way to sneak in some academics this summer; check out all the choices for these day camps. Both half day and full days are offered. The costs range from $79 to $300/camp.